How-to about Free Windows 7 Upgrade. If you have a Desktop PC, Laptop or Mini Netbook that came installed with Windows Vista Home Premium, Windows Vista Enterprise, or Windows Vista Ultimate edition then you may be eligible for a free upgrade to the respective Windows 7 versions. However, certain conditions will apply to determine whether your PC qualifies for a free Windows 7 upgrade offer from Microsoft. These conditions vary greatly among different retailers. I have a PC with Vista Home Premium Edition installed. Will I get Windows 7 free upgrade? You may be eligible for getting a free upgrade to Windows 7 Home Premium edition. Be sure to contact your retailer. Some retailers participate in the free upgrade offer schemes, which render them eligible to give you free upgrades. Is it possible to get free upgrade to Windows 7 directly from Microsoft? It may be possible under certain circumstances. Please visit the Microsoft website for details regarding the upgrade offers. However, if you purchased a branded PC such as Acer, Dell, HP or Lenovo with qualifying Vista editions preinstalled, then you may not be able to get an upgrade directly from Microsoft. Your retailer will have to get you the upgrade through the manufacturer in that case. Is my retailer participating in the free Windows 7 upgrade offer? You will have to check out the relevant section bellow the "Participating PC Manufacturers" for information on that. However, even if you find that your retailer is not listed as a participant in the upgrade offer, you may still be able to get an upgrade from them. Ask your retailer for details regarding that. 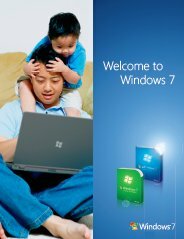 If you purchased a packaged copy of Windows Vista Home Premium, Windows Vista Business, or Windows Vista Ultimate without a new PC, you can order your copy of Windows 7 directly from Microsoft. Need more info? Click here to Read the Microsoft FAQ. If you are able to get free Windows 7 upgrade for your PC, get it today. It will be one decision that you will never regret. What do you think about Free Windows 7 Upgrade? Do you have any Free Windows7 Upgrade experiences, ideas, article, story, opinions, errors, problems and tips which you would like to share? Why not take a few moments and Share it with everyone!